Leaving for school in five minutes. Ummmmmmmm too bad I can't think of anything. Still hot here. In the nineties earlier I think. What's there to say about today? Pretty uneventful as they go. I had cherry pie for breakfast though. And strangely enough, I'm not sleepy right now. Could there be a connection...? This isn't a new song, but I like it. Still can't beat level twelve. It's not making me want to scream and rub my skin off (I haven't done that since I was five...) but I'm not feeling much less frustrated. So my mom had this great idea. She was going to hold a brunch at our house. Yeah, I know, sounds like a terrific (waste of) time, right?!?!?! My friends Gwenny and Meg came with their moms, and we had to sit at the table for two hours and talk and drink tea. I kept getting up partially because I was restless and partially because my chapstick was in my room. When my mom was making tuna spread she asked us to go get a cucumber from the garden. We went outside, couldn't find anything in that mostly-edible jungle. 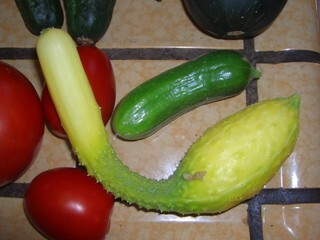 Then I asked my dad, he got the cucumber, and clipped off this other.... thing.... that's supposedly draining the plant. That tea made me sleepy I think. But I'm going to play Corpse Craft anyway 'cause DAMNIT I NEED TO BEAT LEVEL TWELVE. I had a freakin' dream about that level. Which is kind of scary in itself because I can't remember ever dreaming about something that had happened recently before. Things in my dream world versus my real world are just... disconnected. I mean, there might be people I recognize, but 9.9 times out of 10 there won't be anything from my actual life. So yeah. [I took that picture using my memory card in one of our other cameras but I have no clue how the thing works. That's why I like my (broken :'( ) camera, it's just... obvious how it works. You barely need instructions or anything. These Two Words is in the player, along with the acoustic version of Finding Out True Love is Blind.